The classic combination of bacon and cheddar play a flavour role in this homey scalloped potato. Choose old or extra old cheddar for a sure–fire kick of great cheddar flavour. Look for double smoked bacon for an extravagant smokey flavour for the potatoes. In large nonstick skillet, cook bacon over medium high heat for about 8 minutes, turning once or until crispy. Remove to paper towel lined plate. Drain all but 1 tbsp (15 mL) of the bacon fat from skillet. Return skillet to medium heat and cook onion for about 5 minutes or until softened. Set aside. In saucepan melt butter over medium heat and add flour and cook, stirring for 1 minute. Whisk in milk and cook, whisking constantly for about 5 minutes or until beginning to boil and thicken. Remove from heat and whisk in cheese, chives, salt and pepper until smooth; set aside. Peel and thinly slice potatoes. Arrange one third of the slices into greased 8–inch (2 L) square baking dish. Spread with half each of the bacon and onion. Repeat layers once and layer remaining potato slices on top. Pour cheese sauce over top and around sides to cover evenly and reach bottom of dish. Cover with foil or lid and bake in 375°F (190°C) for 1 hour. 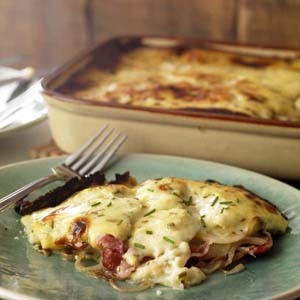 Uncover and bake for 20 minutes or until lightly browned and potatoes are tender. Let stand 5 minutes before serving. Dollop each piece with sour cream to serve. Although traditionally made with rice, risotto is also a cooking method where stirring takes place to help create a creamy consistency. This is a great dish to serve alongside grilled steak or salmon. In large shallow saucepan, melt butter over medium heat. Cook, mushrooms, onion and garlic for about 8 minutes or until liquid evaporates from mushrooms. Add potatoes and cook, stirring for 1 minute to coat well. Add wine and stir cooking until evaporated. Using ladle, pour in about 1 cup (250 mL) of the stock; increase heat to just above medium, but not quite medium high. Cover and cook for about 8 minutes, stirring occasionally until most of the stock is evaporated. Uncover and cook, stirring for about 15 minutes using as much of the stock as necessary. Cook until potatoes are tender, remove from heat. Stir in cheese and basil until melted and smooth. This is true comfort food that can have a healthy twist. 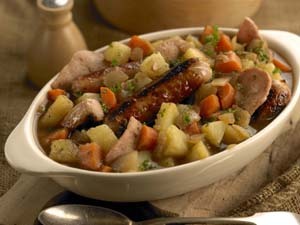 There are many traditional versions of Dublin Coddle but all include sausage, bacon and potatoes that are cooked long and slow in water then sopped up with biscuits and stout. This dish had a ton of flavour and the sausages and potatoes are very tender. The apple cider offers up a soft flavour and the hint of pepper comes through at the end, an enjoyable Irish meal. In large shallow Dutch oven, heat oil over medium high heat and cook bacon for about 2 minutes, turning once or until browned. Remove to plate. Brown sausages on all sides and remove to plate. Add onions, garlic and thyme to Dutch oven and cook, stirring for about 3 minutes or until golden. Add potatoes, carrots, sausages and bacon and stir to coat. Add water, cider and pepper; bring to boil. Cover and simmer for about 45 minutes or until potatoes are very tender and sausage is no longer pink inside. Stir in parsley and serve. Tip: In many homes in Ireland it is recommended that steak sauce, such as A1 be served alongside the stew with lots of stout and biscuits to sop up the juices. Tip: You could also substitute hard apple cider for the apple cider if desired for an added punch of flavour. 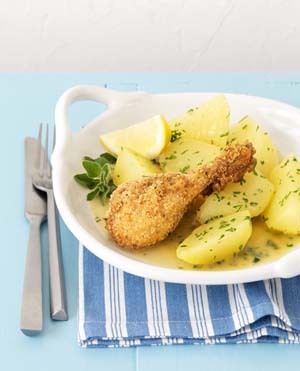 A meal-time dish that’s two delicious recipes in one: moist, flavourful red or white locally-grown potatoes under crispy-crust juicy chicken. Adult peels and chops potatoes. Kids layer ingredients in baking dish. * Vary chicken quantity depending on appetites. Place potato chunks in bottom of 9 x 13-inch (22 X 32-cm) glass or ceramic casserole dish. In a bowl, mix chicken stock, olive oil, garlic, oregano, parsley, salt and pepper. Pour over potatoes. Open flat chicken pieces and lay on top of potatoes. Sprinkle lemon juice over chicken. Mix bread crumbs and olive oil. Sprinkle over chicken pieces. For best results, bread crumbs should be above the level of the chicken stock to stay crispy. Cover dish with foil. Bake in bottom third of oven 40 minutes. Uncover and bake another 15 to 20 minutes, until chicken is cooked through, potatoes are tender when pierced with a fork and bread crumb layer is golden. Sprinkle chopped parsley over chicken. 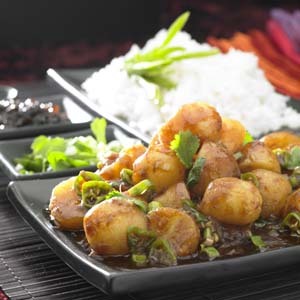 Here, mini red potatoes are cooked Hakka style with flavour and spice. They go as well with fried rice as they do with warm buttered naan. A perfect dish for vegetarians, these potatoes are also great as a side with grilled fish or chicken. Wash potatoes, place in a large saucepan and cover with water. Bring to a boil over high heat. Reduce heat to medium-low, cover pan and cook potatoes until they are just tender but not mushy, about 12-15 minutes. Drain and cool the potatoes. Peel potatoes and halve them if they are too large. Potatoes can be cooked up to 3 days ahead of time and refrigerated until needed. In a small bowl, mix cornstarch with water until smooth. Add soy, vinegar, sesame oil, ketchup and chili sauce. Mix well and set aside near the stove. Warm oil in a deep non-stick skillet set over medium-high heat. Add ginger, garlic and onions. Sauté for 2 minutes, then add cooked potatoes to skillet. Sauté, stirring occasionally, until onions are softened and potatoes lightly browned, about 10 minutes. Give the reserved cornstarch mixture a good stir. Reduce heat to medium and add it to skillet. Stir gently to coat potatoes with sauce. Cook for 30 seconds then switch off heat. Fold in the green chili, green onions and fresh coriander. Transfer to a serving bowl and serve. 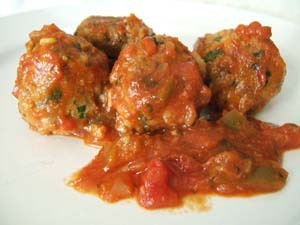 Meatballs should be tender and moist and these fit the bill. These have a southwest flavour and simmered in salsa are perfect served with green beans on the side and perhaps a dollop of sour cream on top. In saucepan, cover potatoes and garlic with water and bring to boil. Boil for 15 minutes or until tender. Drain and return to saucepan and mash. Let cool completely. In large bowl, combine pork, onion, parsley, oregano, cumin, chili powder, salt and pepper. Add cooled potato and mix until evenly combined. Roll into about 1 inch (2.5 cm) balls and place on plate. In large nonstick skillet heat oil over medium high heat and add meatballs. Cook, shaking pan and turning meatballs for about 10 minutes. Add salsa; reduce heat and simmer, stirring gently for about 10 minutes or until no longer pink inside. Tip: Use leftover mashed potatoes, about 3/4 cup (175 mL) if you have some from dinner the night before for the potatoes. Serve up this skillet supper with a green or Caesar salad to complete your meal. It is also delicious with warm pasta sauce or stuffed into a crusty ciabatta bun for a take away lunch for the office the next day. Dice potatoes into 1/2-inch (1 cm) cubes; set aside. In large nonstick skillet heat oil over medium high heat. Add potatoes, onion, garlic, Italian seasoning, salt and pepper. Cook, stirring for about 5 minutes or until edges of vegetables are beginning to brown. Reduce heat to medium, cover and cook, stirring once for about 5 minutes or until potatoes are tender. Stir in roasted peppers and parsley. In bowl, beat eggs and Asiago cheese. Pour over potato mixture, lifting and stirring eggs into mixture with spatula. Cook, for about 8 minutes or until bottom is light golden and top is set. Place a large plate over the skillet and invert frittata onto plate. 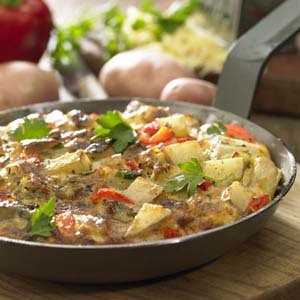 Slide frittata back into skillet and cook for about 5 minutes or until bottom is golden. The addition of potatoes in this curry helps create a creamy weeknight meal. The addition of chickpeas adds protein for a hearty vegetarian meal. In large nonstick skillet, melt butter over medium heat and cook onion, garlic and ginger for 3 minutes or until softened. Add curry paste and cook, stirring for 1 minute. Add potatoes and eggplant and cook, stirring occasionally for about 8 minutes or until beginning to brown. Add coconut milk and bring to boil. 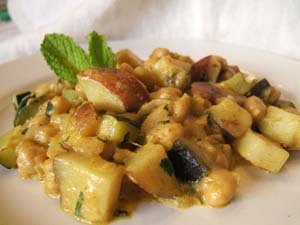 Add chickpeas, zucchini and salt; cover and simmer for about 15 minutes or until potatoes are tender. Stir in basil and mint. 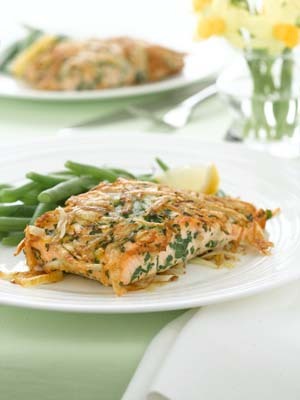 Crisp golden brown potatoes create a lacey exterior crust that surrounds a moist and flavourful salmon fillet. Serve this recipe with crunchy green beans tossed with chopped tomatoes to add some colour to your plate. Grate potatoes on coarse side of cheese grater into bowl. Squeeze potato and discard liquid. Using fork, toss potatoes with oil, cumin and half each of the salt and pepper. In small bowl, combine parsley, lemon rind and remaining salt and pepper. Rub parsley mixture all over salmon. Coat salmon fillets on both sides with potato mixture, pressing firmly to cover. In large nonstick skillet heat butter over medium high heat and panfry fillets for about 4 minutes or until golden brown on one side. Turn over and cook for 3 minutes. Transfer fillets to parchment paper lined baking sheet and roast in 425 F (220 C) oven for about 8 minutes or until golden brown and fish fillet is firm. 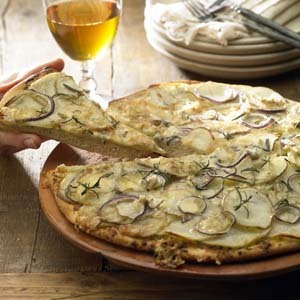 Crisp pizza crust is covered with thinly sliced potatoes for a light tasting pizza. On lightly floured surface roll out pizza to fit 12 or 14 inch pizza pan (30 to 35 cm). Spread with pesto and set aside. Using mandolin, thinly slice potatoes and layer overlapping slightly in concentric circles onto pizza dough. Sprinkle with red onion and rosemary. Sprinkle with salt and pepper. Sprinkle cheese over top of potatoes. Bake in 425 F (220 C) oven in middle rack for about 25 minutes or until cheese is melted and crust is golden brown. Tip: You can substitute your favourite cheese for the Gorgonzola. 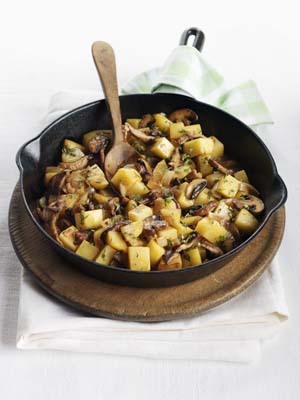 Tastes like the Italian-style favourite, except that instead of pasta this version uses sliced Ontario Yukon Gold potatoes. A satisfying meal that’s quick and easy for kids and parents to prepare. Adult peels and slices potatoes. Older kids can par-cook potatoes in microwave and cook ground beef. All kids can layer ingredients in baking dish. In fry pan, cook ground beef on medium heat, breaking up pieces with back of wooden spoon or spatula. Stir in oregano and garlic. Remove from heat. Set aside. Place sliced potatoes in bottom of 2.5-quart (2.35 L) baking dish. Cover with plastic wrap. Heat on high 8 minutes or until potatoes in middle of dish are tender when pierced with a fork. Use oven mitts when removing cover. Be careful, steam from bowl is hot. Sprinkle flour on top of potatoes. In a bowl, mix cooked ground beef mixture with tomato sauce and spread over top. In bowl, mix cottage cheese, egg and Parmesan cheese. Spread over tomato sauce layer. Sprinkle grated cheddar cheeses over cottage cheese layer. Bake uncovered 25 to 30 minutes, until cheese is lightly browned and sauce is bubbling at edges. Let stand 5 minutes before serving. Meat, whether lamb or beef, is always a favourite at Irish holiday meals. By combining lean lamb with a heavy assortment of vegetables this hearty meal will hit the spot especially alongside some Irish soda or brown bread. The added ease of making this meal is that it can cook long and gently in the slow cooker while St. Patrick Day festivities are brewing. In shallow dish combine flour, parsley, thyme, salt and pepper. Trim any visible fat from chops and dredge in flour mixture. Reserve any remaining flour mixture. Heat 2 tbsp (25 mL) of the oil in nonstick skillet, brown lamb chops on both sides and place in slow cooker. Add remaining oil to skillet and return to medium heat. Cook leeks and onion for about 5 minutes or until browned. Scrape into slow cooker. Add potatoes, carrots and tomatoes to slow cooker. Pour over stock and beer and cover and cook on Low for 8 to 10 hours or until lamb and potatoes are very tender. Gravy: Using slotted spoon, remove lamb and vegetables to large serving dish. In small bowl, whisk together flour and water and stir into remaining juices in slow cooker. Turn slow cooker up to High and cook for about 10 minutes or until slightly thickened. Pour over lamb and vegetables and serve. This is a traditional Irish stew gone to the slow cooker for ease of preparation while the family is away at school and work. 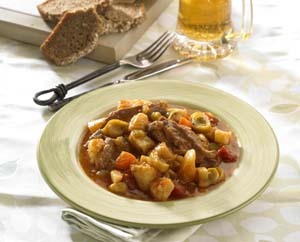 Chunky potatoes fill this hearty stew that will warm you up on a cold night. 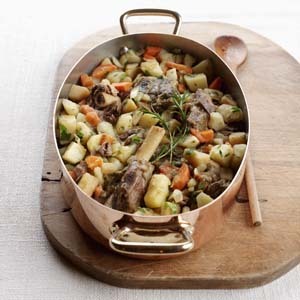 Look for cheaper cuts of lamb for stews like shanks and shoulder or leg chops that are meaty and flavourful. Sprinkle both sides of lamb chops with half of the salt and pepper. Brown lamb all over, in batches, in skillet over medium high heat. Place in slow cooker. Add water to skillet and bring to boil scraping up brown bits. Pour liquid into slow cooker. Return skillet to medium heat and cook onions, carrots, parsley, thyme and remaining salt and pepper for about 8 minutes or until softened and beginning to turn golden. Scrape into slow cooker. Add stock and potatoes. Cover and cook on low for 8 hours or until lamb is tender and easily pulls away from the bone. In small bowl, mash together butter and flour until well combined. Uncover slow cooker and stir butter mixture into stew and cook on high for 20 minutes or until slightly thickened. Baby potatoes, coated with a thick, mildly spicy marinade, grilled on the barbecue until lightly crisp and golden. If you wish, you can intersperse pieces of sweet red or green pepper for added colour. Or, try making the skewers with potatoes only. Wash potatoes, place in large saucepan and cover with water. Bring to a boil over high heat. Reduce heat to medium-low, cover pan and cook potatoes until they are just tender but not mushy, about 12-15 minutes. Drain and cool them. Peel potatoes and halve them if they are too large. Potatoes can be cooked up to 3 days ahead of time and kept refrigerated until needed. Cube paneer into 1-inch pieces. Set aside. Mince garlic and ginger together in food processor and transfer to a large mixing bowl. Add yogurt and beat with a spoon to break up all the lumps. Add all the remaining ingredients except vegetable oil and lime juice. Mix well, then add potatoes and paneer. Toss gently to coat with marinade, cover and refrigerate for at least one hour. When ready to grill, preheat outdoor barbecue to medium-high. 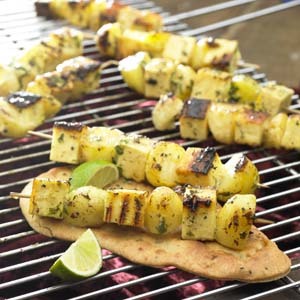 Thread potatoes and paneer onto skewers, starting with a paneer cube, then a potato and so on, ending with a paneer cube. You should have about 3 potatoes on each skewer, interspersed with 4 cubes of paneer. Repeat similarly with remaining skewers. Place skewers on barbecue and grill until golden, slightly charred and tender, about 7 minutes. Brush lightly all over with vegetable oil and grill for 2 -3 more minutes until they have crisped up some more. Transfer to a platter and sprinkle liberally with lime juice before serving. This is a quick dinner my grandmother puts together when she’s not in the mood for pasta. It is filling and warms your insides. The combination of potatoes and zucchini is moist and creamy. These can be made up to one day ahead and reheated if you prefer. Trim ends of zucchini. Cut each in half lengthwise. Using small spoon scoop out inside seeds and some of the flesh, leaving at least 1/2 -inch (1 cm) thick wall. In large pot of boiling salted water, cook zucchini for about 8 minutes or until tender-crisp. Remove from water with slotted spoon and drain; set aside. In same pot, add potatoes and cook, for about 20 minutes or until tender. Drain well and return to pot. Using potato masher, mash potatoes with 3 tbsp (45 mL) of the oil and garlic. Let cool slightly. Stir in egg, parsley, cheese, salt and pepper. 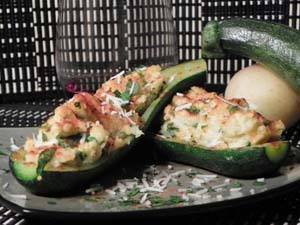 Fill each zucchini half with mashed potato mixture. 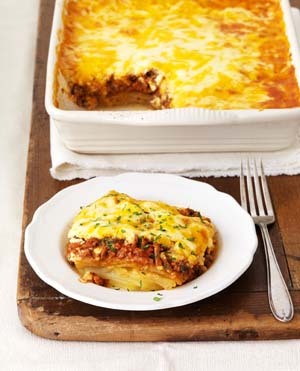 Place in single layer in large greased shallow casserole dish. Sprinkle tops with paprika. Drizzle zucchini with remaining oil; cover with foil. Bake in centre of 400°F (200°C) oven for about 15 minutes or until steaming and zucchini is tender. Remove foil and bake for another 5 minutes or until potatoes are light golden. Tip: This is also a delicious side dish for any holiday or family meal.